“The goal is to find a decision that moves the city forward. You don’t measure it that way. Would a Super Bowl be good for the city and good for the NFL? I think yes. Would having the NFL draft here be good for the city and for the NFL? The answer is yes. The goal is to have a discussion,” Emanuel said. Chicago houses the NFL’s smallest stadium in terms of capacity. Soldier Field seats 61,500 — 8,500 shy of the NFL’s preferred minimum for a Super Bowl. To be fair, Emanuel spokesperson Sarah Hamilton also said that the idea of adding more seats to Soldier Field was also motivated by a desire to get more revenue from concerts or outdoor NHL games — okay, no, wait, that’s just ridiculous, who on earth adds seats to a football stadium in order to make more money off of outdoor hockey? This is a Super Bowl grab, pure and simple. Which is, as I’ve covered recently, just about the worst reason possible to spend a lot of money on stadium renovations, especially for a stadium that was just entirely rebuilt at a public cost of $432 million a decade ago. Though maybe in the course of adding seating, they could do something about Soldier Field being the ugliest piece of architecture on earth? Almost certainly not — more seats is only going to make it look more like a spaceship that crashed into a vintage stadium — but we’ve gotta grasp at silver linings where we can. In an interview with Comcast Sports Net, [former Chicago mayor Richard] Daley said the city should build a new stadium and add a second NFL team to the market. “I really believe we could get a second football team,” the former mayor said. “I’ve always believed — the Chicago Cardinals, Bears — why is it that New York has two? Florida has three, San Francisco has two. Now you think of that, we could easily take — Chicago loves sports and we could get a second team in here. Because if the NFL has waited two decades to put a team in L.A., surely it’ll rush to pay to build a stadium for a second team in a much smaller metro area, right? Also, the last NFL stadium in Chicago was such a rip-roaring success. And Florida isn’t a city, and San Francisco … you know, this is more than an offhand radio remark by a guy who isn’t even in charge of anything anymore really deserves, so I think I’ll leave it at that. Yesterday, the Chicago News Cooperative reported that the Illinois state fund that’s paying off the construction of the White Sox‘ U.S. Cellular Field and the reconstruction of the Bears‘ Soldier Field is running short of funds, and will need to be bailed out by city taxpayers. With the hotel tax revenues designated for stadium expenses coming in below projections, the state has withheld $1.1 million in income tax money that would normally go to the city of Chicago. On one level, this isn’t actually a huge buy lorazepam in the uk deal — as with recent tax squabbles in Miami and Cincinnati, taxpayers were going to be on the hook for these costs regardless, so it’s just a matter of which taxpayers, city or state. And Chicago has been kicking in $5 million a year toward the stadium costs in any case, so this just adds marginally to the bill. 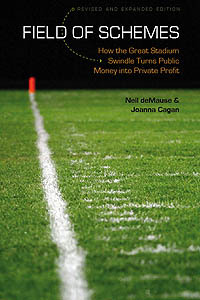 Still, it’s a reminder that assigning a certain tax revenue stream to pay off stadiums — or really, to pay off anything — is in the end a bookkeeping abstraction: If the tax money doesn’t come in, you still have to make the payments, the same as if you buy a new car and plan to pay for it with the raise you’re expecting, and then the raise never materializes. (Note to younger readers: “Raises” and “new cars” were well-known before 2008; ask your parents.) In the end, public costs are public costs, and pretending they’re not because somebody else (hotel guests, car renters, cigarette smokers, racino patrons) has had their taxes earmarked for them is just sophistry.